For being a former coconut hater, I sure do love it now. Whether it’s a side effect of giving up dairy and relying more on cashews and coconuts or the maturing of my palette, I’m all for coconut these days. So it was only natural that I tried my hand at macaroons. Spoiler alert – nailed it. Traditionally, macaroons contain sweetened condensed milk and eggs. But to keep mine vegan friendly, I skipped the eggs altogether and sweetened them with maple syrup! This simple swap kept them naturally sweetened and still seriously delicious. Another perk? These are easy to make! Just 30 minutes from start to finish, and it all starts with blending your base ingredients in a blender or food processor. Once you have your base sweetened and the consistency of a dough, scoop out Tablespoon-size amounts and arrange them on a greased baking sheet. Then, bake away! These little guys brown up quickly, caramelizing the underside and giving a slight crust to the outside, while keeping the centers tender. And the last (and perhaps most important) step – the dark chocolate dip! While these may not be as fluffy as traditional macaroons (due to the lack of eggs), the flavor is spot on and I actually prefer the slightly dense texture. So much coconutty goodness happening here. And I’m happy to report that they’re husband approved – a big perk in my books. If you make these macaroons, please let us know! Leave a comment and rate it. And don’t forget to take a picture and tag it #minimalistbaker on Instagram so we can see. Cheers, friends! 5-ingredient Vegan Macaroons dipped in dark chocolate! 30 minutes from start to finish and so simple and delicious! Using a 1.5 Tbsp scoop (like this one) OR a 1 Tablespoon, scoop out enough coconut to fit inside the scoop and pack firmly with your hands to get an even shape, then use your finger or the loosening device to slide it out into the shape of a half circle. Gently lay on baking sheet and continue until all coconut is used - about 10 macaroons for a 1.5 Tablespoon scoop and 15-20 for a 1 Tablespoon scoop (amounts as original recipe is written // adjust if altering batch size). Made these for Passover tonight. I had a hard time with the recipe, too, so I ended up doing it in stages. I processed the coconut for a LONG time (and the texture was cookie batter-like), but it just crumbled when I tried to scoop it out with a measuring spoon. I put the batter back in the fridge, and tried scooping it a few hours later; same thing. Then I processed the coconut AGAIN, and this time it held together better (but still crumbled a bit, so I was careful). I did a test run of these over the weekend in preparation for Passover next week. They were perfect. I had no issues with them falling apart. I did wait several hours to dip in the chocolate. I think using a small cookie scoop was key. I also added a smidge extra maple syrup because I like my macaroons very sweet. And since these were so easy to throw together I hope to make them regularly and not just for Passover. I had a hard time with this recipe, too. Maybe I didn’t process the coconut long enough, but they were way too fragile and fell apart even when I tried to scoop them onto the cookie sheet. Hi Erika, using this cookie scoop is really helpful for preventing them from falling apart. Hope that helps! What adjustments should I make to the recipe if I make sweetened condensed coconut milk to add to the recipe? I was just at the home of one of my students tutoring him and his grandmother made these without dipping them in chocolate and they were freaking amazing! I can only imagine how much better they would be in dark chocolate but I have to say they were pretty gosh darn tasty! Can’t wait to try and make them myself! Hi does the recipe call for desiccated coconut shreds or fresh coconut shreds? I think the difference would affect the recipe significantly. I don’t want to mess it up. Thanks. Hi Jules! This recipe calls for shredded unsweetened coconut. I would like to try these as a vegan alternative to a macaroon recipe I use for our coffee shop. Do I need to use unsweetened coconut? I would like to try regular, inexpensive sweetened coconut but thought I would ask first. Hi Lynne! Regular should work, but let us know how it turns out! I’m going to try these with beaten aquafaba/xanthan gum as an egg white substitute. This was the year I perfected vegan matzoh balls using that combination. Health and peace. Hi Stacey! I am not sure but if you try it, report back on how it goes! Thanks for these wonderful recipes, you’re my go-to when I want to whip up something. I made the coconut macaroons and they were delicious. I substituted vanilla extract with Orange pure extract as I like the dark choc and orange pairing and it was divine. Waiting or more awesome recipes from you. I Made these on the fly today. Simple, fast and everyone loved them. I accidentally added the coconut oil to the mixture and thu turned out perfectly. They were almost like a cross between a macaroon and a shortbread cookie. Thanks! Really wanted these to work but there is nothing to bind the coconut together. Need to add the oil to the mixture first or even flax seeds might work. They fell right apart trying to dip them into the chocolate. Need to rethink the recipe. Would adding some aquafaba work in this, to replace the egg? Just wondering. Hi Ellie! That should work! I just tried making the macaroons. I could not get the coconut to become like dough. I tried the food processor as well as the Vitamix. Coconut is too fluffy for the blender–the coconut stays on top and will not churn down to the blades. I mixed a long time in the food processor but it would not come close to butter consistency. I added the maple syrup and vanilla and proceeded anyway. It was too crumbly to form a firm ball. Am mystified why this is not working for me, seeing the positive reviews. I was looking for a quick cookie recipe and found this one. They turned out perfectly. I will definitely be making these again. Delicious! Made with organic unsweetened shredded coconut and 70% equal exchange dark chocolate. They even please the toughest critics–my 8 year-old daughter and 5 year-old son! A vegan Passover treat success! I made this recipe today and I had some trouble with it. When I shaped the dough it looked just like yours but when they went into the oven the mounds slightly “melted”and created a lace effect around itself. When they came out of the oven, I knew there was no way I could pick them up without them crumbling on me. So I put them in the freezer in hopes that the coconut oil would helped it stiffen up. Thankfully that worked! I was able to dip them into chocolate but only if I added a bit of coconut oil to the chocolate to loosen it up so the macaroon wouldn’t get stuck in the chocolate. Overall it turned out ok, but not picturesque like yours. It tastes great and it is a wonderful dessert for passover. However, its more of a dense filling of coconut dipped into chocolate, than a fluffy macaroon. Thank you! I was wondering if I can substitute the maple syrup with honey instead and if so, would it be the same amount? 1:1? And if I decided I wanted to add egg how would i do that? I know it won’t be vegan anymore but I’m curious in what difference would it make. I kind of want to try to make it with and without eggs to see. Hi Tracy! Honey should work fine! As for the egg, I am not sure! If you try it, report back on how it goes! These are really easy and delicious. I don’t have much use for coconut oil so I left that out and they worked perfectly. I do wonder what brand of shredded coconut you used, though. I used Great Value Unsweetened Shredded Coconut from Walmart and the calorie count is about twice what you have for 1/10 of the recipe. I think it made more, so it’s not a big issue, but I wonder if I’m using too much coconut? I assume more coconut would fit into the 3 cups’ worth if it’s more finely shredded. I love all your recipes, but this is one of my favorites I’ve made so far! Who doesn’t love a good macaroon?! My friends all loved them and couldn’t believe I made them on my own! Thank you for all of your easy, delicious, vegan recipes! Loved how simple it was to make. I tend to gravitate to raw macaroons but saw the 3 ingredients needed (coconut, vanilla and maple syrup) and had to try. I made large ones as per your recipe then a second batch of bite sized ones and added 3 tbsp. of Cacao to the mix. Yum. Thanks for sharing. Pretty disappointed in how these turned out. The macaroons themselves were far too delicate and fell apart almost immediately. I lost several to the chocolate dip alone. The bonding agent of eggs was sorely needed to keep these cookies intact. I love coconut as much as the next person but this was kind of like eating coconut dust that tasted faintly of maple syrup. I’ve tried quite a few MB recipes (and loved so many of them! ), but this is not a recipe I’ll be repeating. I and my 11yo agree with Caitlin. I loved the idea of a 5-ingredient recipe and looked forward to a sweet and gooey macaroon, but this wasn’t it. I’d like to try again though — any suggestions on what I could add so they turn out gooier? I followed the recipe and measurements to a ‘T’. I made two batches and am waiting to see if after cooling completely the chocolate makes a difference in taste. I just tried a different recipe for vegan macaroons with Aquafaba and they just fell apart :( can’t wait to try yours! I’m thinking the sticky maple syrup must keep them together nicely! I just made these today but added pecans and used agave instead. I also flattened some and am letting them cool before adding the melted chocolate. Thanks for this recipe. Very simple and easy to make!! Oh my, these are so easy, delicious, and lovely – thank you!! Wow these were seriously amazing. So easy to make, I even subbed semisweet baking chocolate for dark chocolate, because the grocery store I was in didn’t have any dairy free dark. Oh well, these were divine! 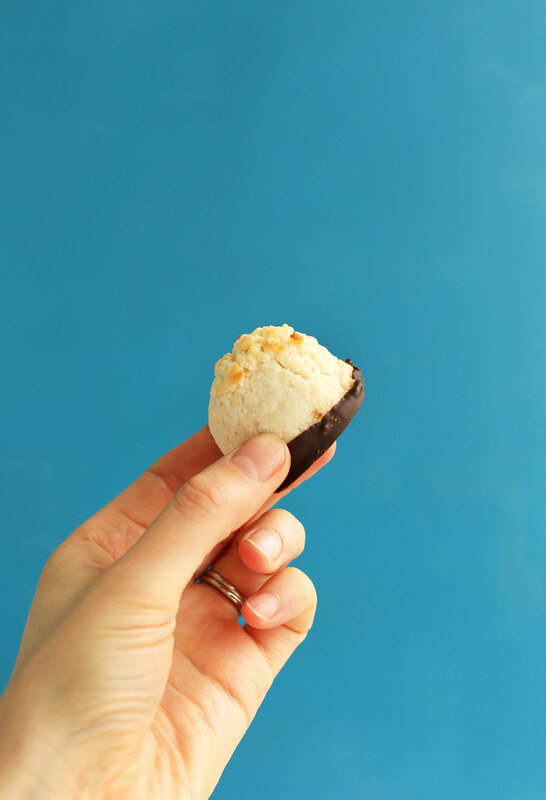 Pro tip: the longer you wait for your macaroons to cool, the better. I waited for maybe 30 minutes, but some of them still lost their bottoms in the chocolate coating! Another tip is that these heat excellently after having been frozen: microwave for 40 seconds and the chocolate is ooey and the coconut luscious! Will definitely be making again soon! Love lot’s of the recipes, but this one just didn’t do it. Not moist enough. Too labor intensive. Hey! I am trying to lower my sugar consumption, Do you have any suggestions for what might work as a substitute for the maple syrup? I know it may not be possible, but thought it wouldn’t hurt to ask! I assume the syrup is necessary to hold it all together so can’t be omitted entirely? My coconut flakes were very dry, and I managed a coconut flour in my 14-cup food processor. So, I added about a tablespoon of coconut oil and kept processing. It was still a bit dry, but the addition of the maple syrup and vanilla brought it all together. I also added 3 drops of wild orange essential oil to the blend and it could be detected, subtly, in the cookie. Also, I tried using the scoop with the loosening device, but my “dough” was too dry for that; it kept crumbling. So I switched to a plastic tablespoon. If I added a drop or two of coconut oil and spread it around in the tablespoon, then scooped up the dough and packed it in, it came out just perfect! I had to reapply the coconut oil to the tablespoon after about every two scoops. These came out beautifully toasted and were well received by my coworkers! and it was in the processor for about 7 mins and still didn’t do anything other than become finer. Is it crucial to use a particular type of shredded coconut? Can’t wait to get it right they look very yum! Hi Christine! I used small shredded unsweetened coconut, which I got in bulk at Whole foods. Larger flake coconut will be more difficult to process, just because it’s a bit drier. Did you try adding more maple syrup (or even a little coconut oil) to moisten? Oh my goodness!!! These were awesome and so simple and quick to make. I substituted the maple syrup for coconut palm syrup to stick with the whole coconut theme of the recipe and they came out wonderful. Here are a couple of pics of how mine turned out. I decided to decorate them a little with the left over chocolate by just striping them with it; next time I’ll make them look prettier. Not sure how to upload the pictures, any suggestions? These look great. Thank you! Just want to ask – can one dispense with the oil, or use something else that might be lower in fat? Soy milk? Thanks again. I love the recipe and don’t mean to be picky. 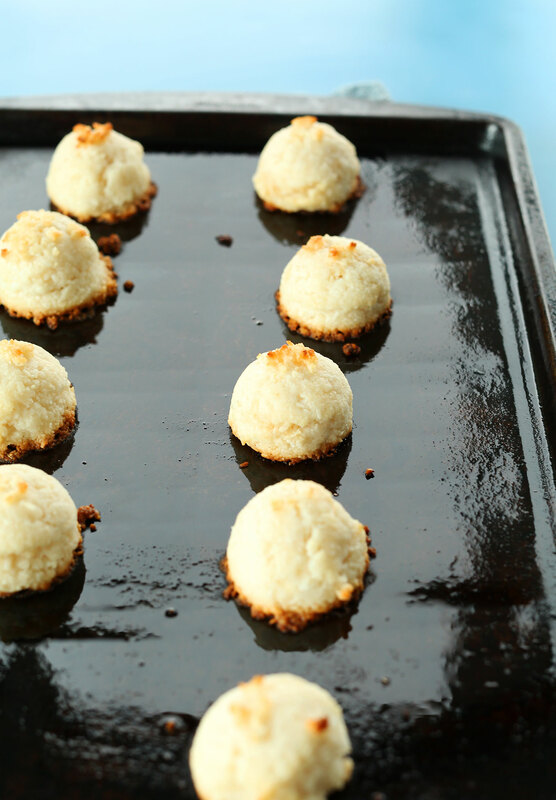 Instead of adding coconut shreds to the top of the macaroons, I tweaked this recipe by adding in a spoonful of coconut shreds to the dough mixture, so as to evenly distribute that texture throughout. Is there anything you could substitute for the maple syrup? Agave or honey, if not vegan. brown rice syrup should also work! I just made these for the first time and only had 1 tbsp. of maple syrup left, so I also added 1/8 tsp. of liquid stevia. Tasted great! I made this using coconut flakes (only because it’s what I had) and used agave instead of maple syrup. I used a food processor and did have to scrape down the sides but had no issue getting them into the scoop, just had to press firmly. These were fabulous! Thank you for this recipe! Howdy! These were quite delicious. However, they didn’t ever turn into balls in my food processor! I had to add an extra tablespoon of maple syrup to bind them and REALLY press it into my scooper to avoid having it completely crumble on the baking sheet. They do take some manipulating depending on the equipment you’re working with, but I’m glad you had success! I’ve made these 3 times now and they are always a HUGE hit!!! The only problem I have with them is that they are hard to form into balls, they just crumble. Is there anything I can add to prevent this? I eventually get them into balls, it just takes a long time and a lot of pressing! Also, another reader said theirs fell apart when dipped in the chocolate, mine do too. No matter how long I let them cool down. To fix this issue I actually put melted chocolate in a little ziploc baggie and cut the tip, then drizzle on top! I made these for a baking competition and won! Totally Delicious Macaroons, Baby! These look amazing! Is it possible to use coconut flour instead of shredded coconut? Would it be the same amount as shredded coconut? I don’t think it would be the same, but let me know if you give it a try! I made these for my birthday party last weekend. They looked just like the pictures! I was the only vegan present, but everyone freaked out about how delicious they were. Great recipe!! i love your recipes because i almost always already have the ingredients on hand… aka I am SO making these tonight! I tried this recipe, and they tasted amazing! However, I did notice that they fell apart quite easily, and did not hold their shape, would you have any suggestions? Not sure if I did something wrong. I tried this recipe, however it did not work for me. I had organic shredded coconut, and the consistency stayed the same…did not get buttery. Do you think that my blender is not that good? Must’ve been your blender. Next time try a food processor! Hi there! my coconut never got to the “dough” texture, I used a blender & kept going but it never even remotely got to that stage. Is it a “dry” coconut you use & where do you normally purchase it? Is it fresh shredded coconut with milk/ juice in it? If yes, do i squeeze / drain off the milk/ juice? Hey there! I cooked up some of these tonight and threw almonds on the tops of some of them! As well as drizzling some extra dark chocolate on top and they are stinkin delicious. Thank you for the recipe! Hey! I was wondering what kind of coconut you are using for this recipe? Featured these cookies on my blog today, SO delicious and super easy! Thanks for the awesome recipe! Hi! This recipe is amazing! I really want to try it, but I don’t have coconut oil. Is there a substitute for cocnut oil? It doesnt have to be vegan. Could I use butter or oil? The coconut treats were so delicious. I did add some dried cranberries ( with apple juice only for their sweetener) to coconut while processing. Also I dipped the whole macaroon into the chocolate. I made these over the weekend and they are to die for!! Yes, you do have to scrape down the sides when blending–I have a Vitamix and found that if I leave it on 5, I can scrape the sides and get it right! Also found that when dipping in the chocolate, the easiest way is to put the macaroon on a fork—it doesn’t fall apart. LOVE< LOVE these! Thank you! Today, I hate coconut. I’m glad to know there’s hope for me still. Hi. I used am immersion blender- no food processor or blender at home. Did the job. I only had choc chips at home but I wanted to try them out. They are yums! I imagine it would be much yummier with the dark chocolate. I also had mine while still warm- melts in your mouth and also coats the palate, which I enjoy. I will repeat the recipe again- it’s a keeper. Thanks! These are delicious! My husband didn’t even wait for them to fully set (sigh) Thank you for this awesome easy recipe! Those look amazing. I noticed all of your recent recipes are vegan. Have you slowly migrated into veganism? I have for the most part! I’m not 100%, but eat that way most of the time. Thanks for asking! 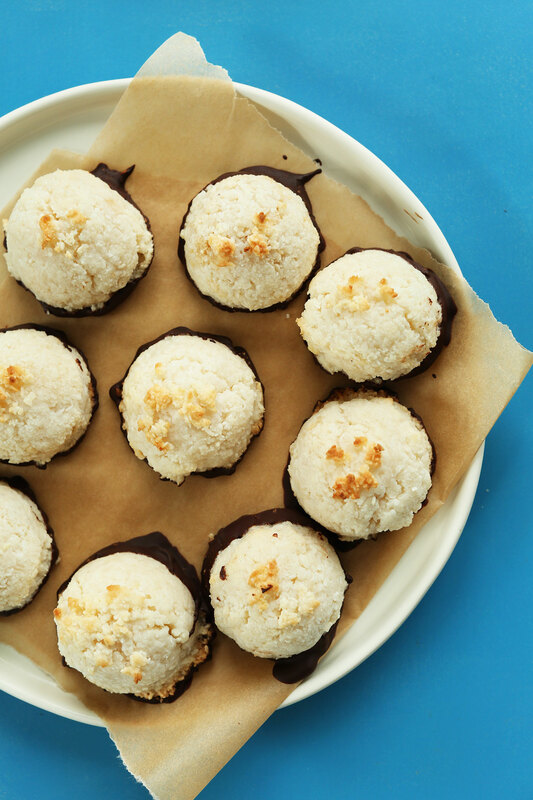 I started making the coconut macaroons from your book (which are similar to these but don’t require baking) before reading the comments here. I used desiccated coconut and I can confirm that I could not get dough consistency. I did however use some extra coconut oil and managed to form them into not very symmetrical ovals by pressing a generous amount of mixture in my palm. They don’t look very nice but they taste great! Freezing helps keep them from falling apart. I will definitely be trying them again with non-desiccated coconut. The dark chocolate dip is definitely the most important bit! Beautiful pictures…This looks so easy, will definitely try this out. 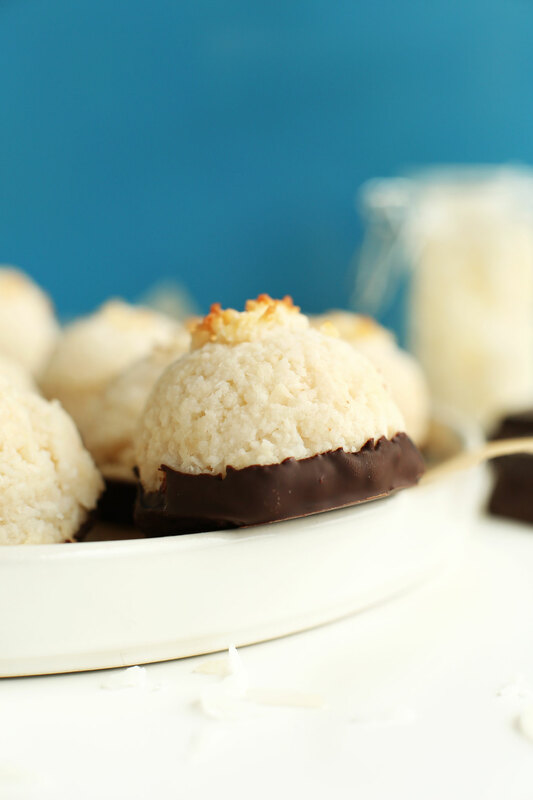 Coconut macaroons are the only kind of macaroons and I love them.But I have never tried them with the addition of the bottom being dipped in chocolate I plan to very soon after seeing these. I can’t imagine life without coconut these days, but a few years back it was a back cupboard ingredient! This will be a fantastic recipe for my son who has an egg allergy. They look so delicious! Buen dia, desde Zaragoza, España, os sigo con mucho interes, y respeto. I blended the coconut for a while, but the consistency of a slight dough was never reached. Should I have blended for more than 5 minutes? It’s a shame because the macaroons in your photos look so fabulous, but I couldn’t find the right consistency to make the macaroon ‘dough’. You may need to scrape the sides down to encourage things along. What kind of blender / food processor did you use? I just made yesterday and it took a good while to get the dough consistency. I was going to give up but I keep the coconut frozen and thought that might have been the problem. I used a food processor and just keep doing it. I don’t have a food processor, just a LG blender, so I use.an immersion blender in a tall jar & it works great! Hmm, what kind of coconut did you start with? And you do have to scrape down the sides to encourage it along! Something similar happened to me but I am using a vitamix- my shredded coconut turned straight into coconut flour without turning into dough. I used Let’s do Organic brand coconut and I’ve always thought it seems on the dry side. I added 3-5 Tbsp of coconut oil and mixed it by hand into a dough. The sides started to melt a little in the oven but they held up fine. Macaroons turned out amazing! Yum! I’m a coconut hater buuuut I may make these to surprise the coconut lover in my life. Haven’t been receiving your emails lately. Do you still send them out when you update your blog? Yup! Every time a new post is published. Possibly check your spam or other filters? YUP. I made these immediately. They look and taste really impressive, but they’re SO easy! Brava! These cookies look completely delicious!!! And this recipe looks delicious. Yay coconut! Thanks Abby! I’ve been shooting pretty much every recipe on it since making it. Swoon! Just made these…they are as delicious as they look. I love coconut and dark chocolate so I did not wait long to try these. The first few fell apart completely when I dipped them in chocolate but that might be because I wasn’t patient enough to wait long enough for them to cool. Others turned out great. I am currently waiting for the chocolate to set so I can devour more (and maybe share with my husband)! haha, yeah they can be a little tender! But if you pack them really securely when scooping, that shouldn’t be a problem. Glad you enjoyed them, Natalia! Thanks for sharing. I’d actually love to freeze them so they taste like ice cream! 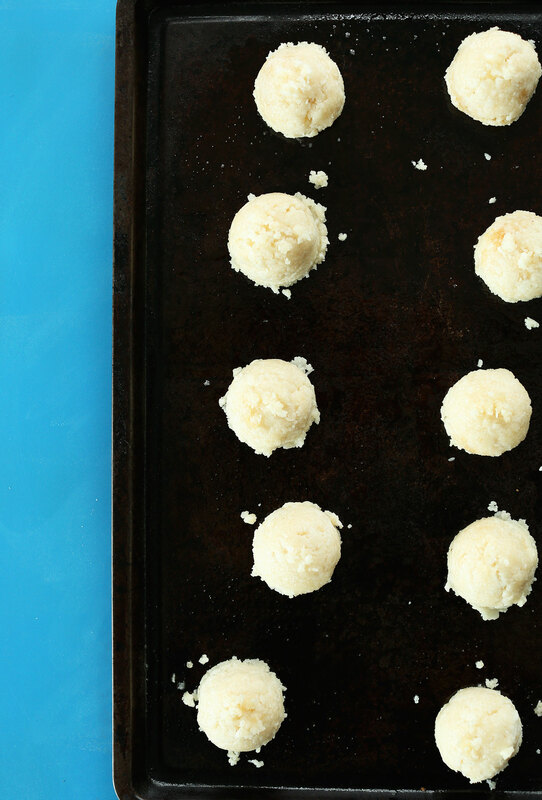 These macaroons look so simple and easy to make, and so delicious! 5 ingredients? Yesssss! I’m also a former coconut hater, now I like it for some reason! 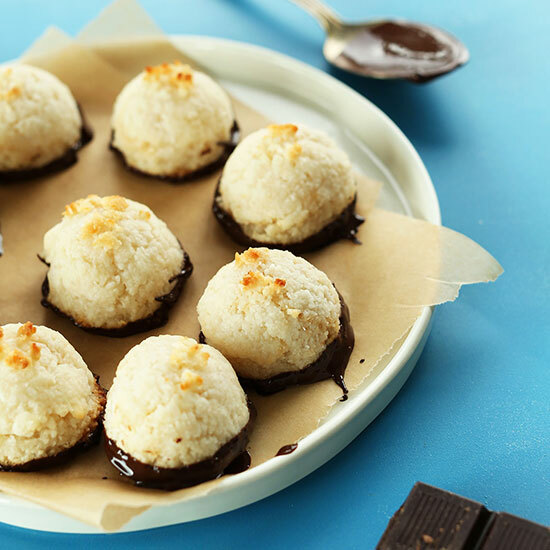 This coconut and chocolate combo seems like such a yummy combo : a bit like Samoa Girl Scout cookies! Oh my, Dana…it’s like Ferrero Raffaello but even better – with chocolate. I always LOVED coconut but funny thing happened to me: just before I turned 40 (yes, that stinking stage of life), my body started rejecting coconut. I am “allowed” to have a tiny amount of it, otherwise I feel nauseated :-( I think I’ll make them anyway, maybe half the size. Yeah! Ah! Rejecting coconut? The worst. Hope you can still indulge a little! Coconut is my favorite. They look so tasty! I will definitely be making these. asap! Anything with chocolate+coconut is delicious in my book. These look fabulous! Dana, do you dreams about recipes!? I can’t believe you come up with some great, wonderful combinations of few ingredients and whip up a recipe in a heart beat!!! Whatever you do, keep doing!!! I need to make these ones soon.. I haven’t had a macaroon since following a plant-based diet! Thank you !!!! I have been looking for a vegan macaroon recipe so I can try the mixture before it is baked to make sure it tastes good – and I think I have found it! 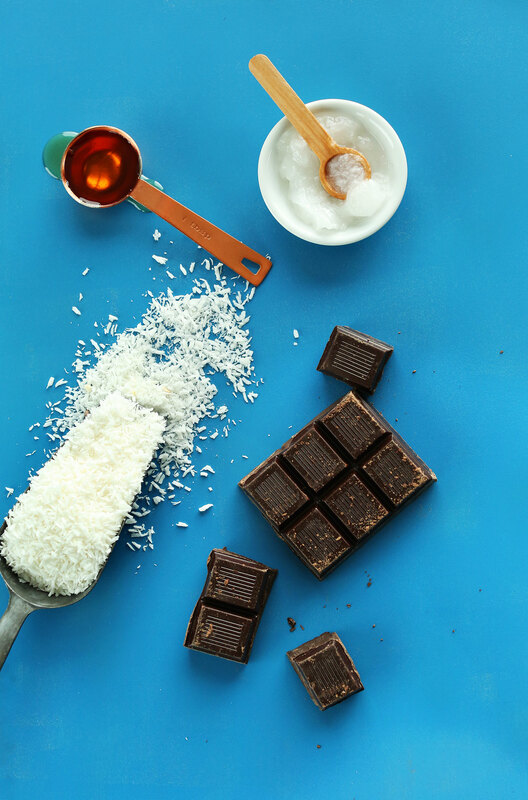 These look amazing; I love chocolate and coconut together – pinned! Thanks Eve! (beautiful name btw) Hope you love these! This looks and sounds so good! And only 5 ingredients? I’m sold. Thanks for another amazing recipe! Thanks for the sweet note! Hope you love these! Ohhhh, my mother adores macaroons and these would be perfect for her for Mother’s Day! Thanks for the inspiration! Best daughter ever. Also, I love you? that’s been delicious while I was reading! I buy a few ingredients and then Iam going to bake it! Coconut is the most delicious substance known to humans I think, but especially when combined with chocolate! These look awesome and are actually all the simpler too for leaving out the egg and condensed milk. This sounds so delicious – I used to be a coconut hater too and I adore it now! Love that it doesn’t contain egg whites either! I am a former coconut hater too! I think it was because of a bad almond joy experience. 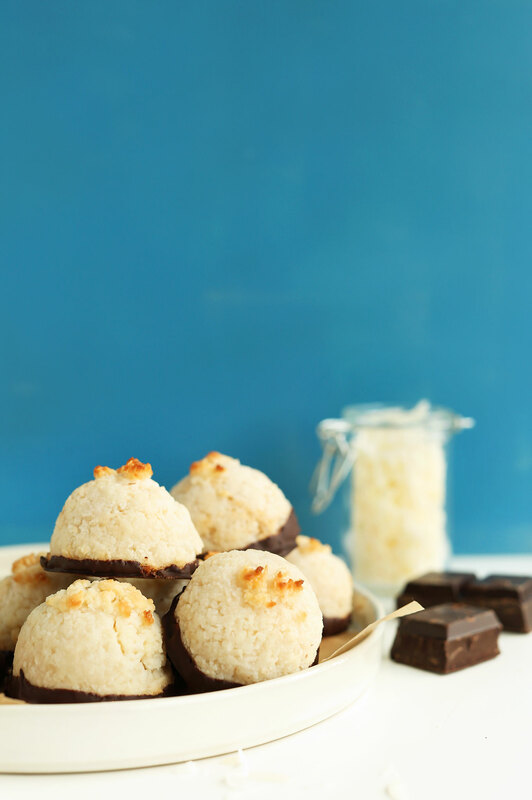 But I LOVE coconut macaroons now, especially dipped in chocolate:) Great recipe! yeah, almond joys rubbed me the wrong way as a kid. I hated them! But now I’m in love with this flavor combination! 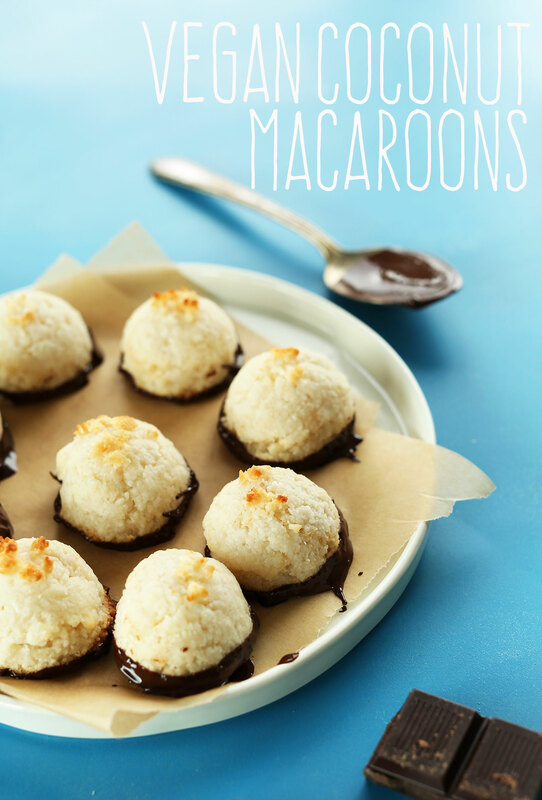 macaroons are one of my favrorites..this vegan version sounds wonderful! !